Aborigines have the longest continuous cultural history of any group of people on Earth. Estimates have dated this history between 50,000 and 65,000 years. The Creation or Dreaming stories, which describe the travels of the spiritual ancestors, are integral to Aboriginal spirituality. 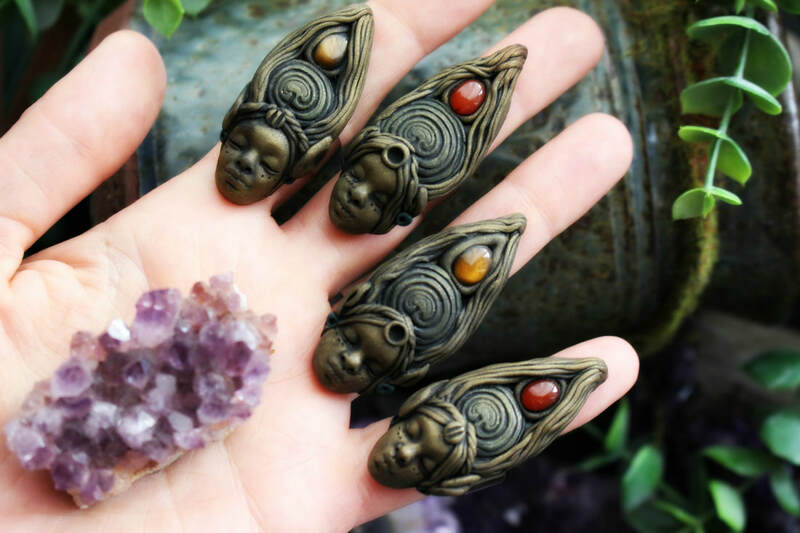 In most stories of the Dreaming, the Ancestor Spirits came to the earth in human form and as they moved through the land, they created the animals, plants, rocks and other forms of the land that we know today. 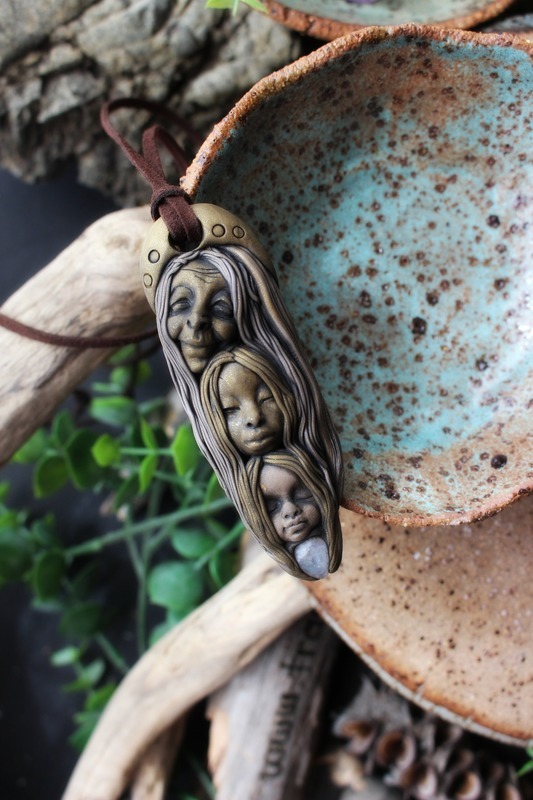 Some of my newer necklaces are inspired by the Gunaikurnai people, the traditional owners of Gippsland, Victoria, Australia. The Brataualung people, are the traditional indigenous owners of South Gippsland...from Cape Liptrap, Tarwin, Port Albert and Wilsons Promontory...this is where I source my inspiration. Gunaikurnai people are made up of five major clans. Brabralung. Brataualung. Brayakaulung. Krauatungalung. Tatungalung. 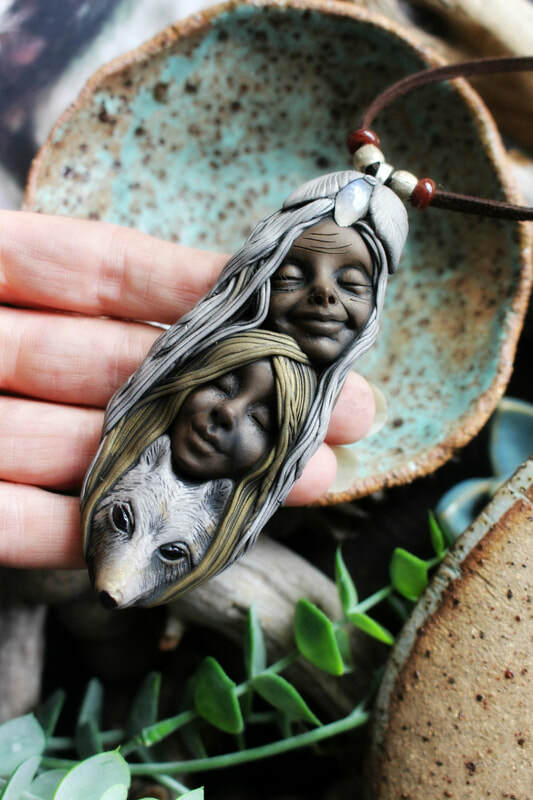 Crone, Mother & Maiden (and Wolf ...And Owl). 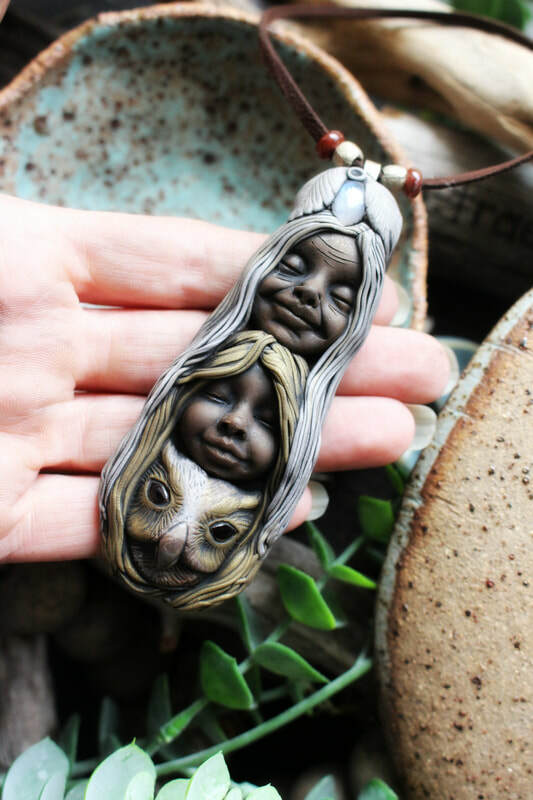 The first of these necklaces was inspired by an illustration I did called "Crone, Mother & Wolf", then came the Owl design, and of course the traditional Crone, Mother and Maiden. 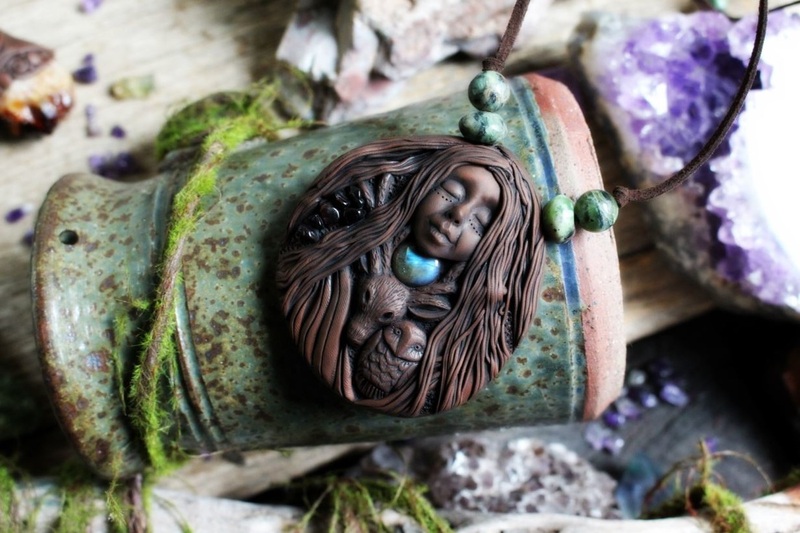 'The Mother' represents abundance and growth, the gaining of knowledge. 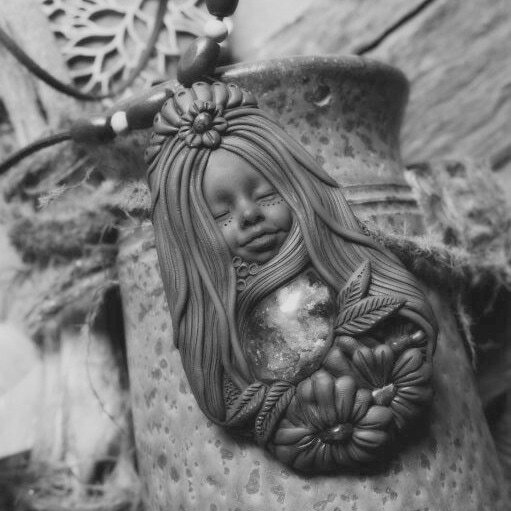 She is fulfillment -- sexual, social, and emotional -- and she is represented by the full moon. Springtime and early summer are her domain; as the earth becomes green and fertile, so does the Mother. Regardless of your age, if you’ve birthed a creation of any sort, give it time and tender loving care. 'The Crone' also known as the hag and the wise woman, she represents the darkness of night, stillness, she is wisdom, she is guidance and truth. The Crone is usually old…but not always. Regardless of your age, if you know, sense, or feel that it’s time to move on with a project, a job, a relationship, do it. Be bold. Cut the cord. Feel the grief. Walk away. 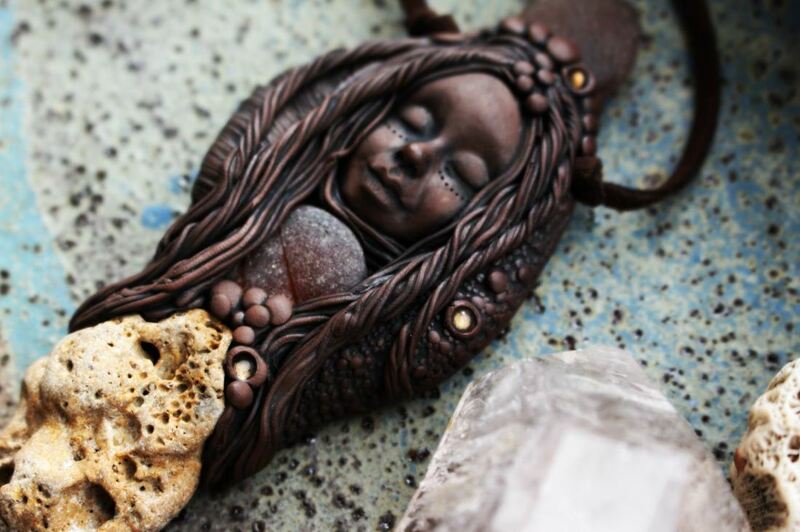 'The Maiden' embodies the creative force. Her purpose is to attract. Dancing with wild abandon, she gathers the stuff of life – big dreams, bold ideas, and intense desires. Every Maiden isn’t young. Every Mother doesn’t have a child. Every Crone isn’t old. What’s important is the energy each embodies and how it makes itself known. 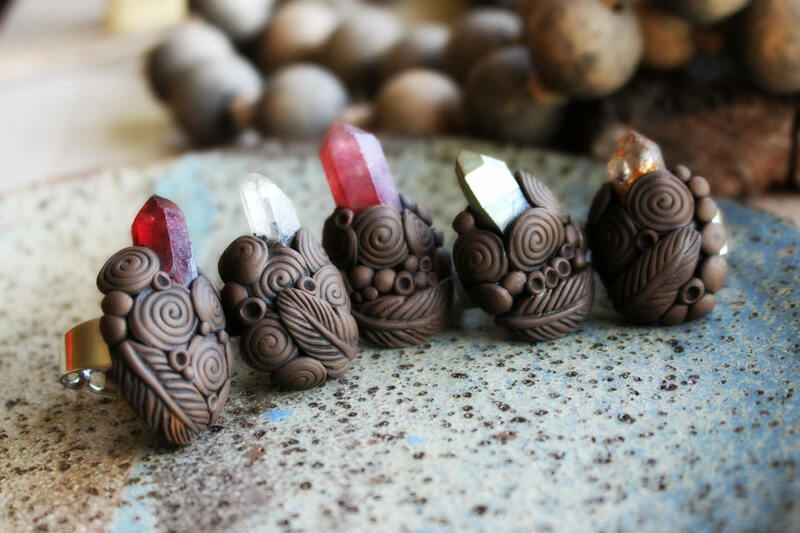 ​'The Owl' is emblematic of a deep connection with wisdom and intuitive knowledge. If you have the owl as totem or power animal, you’re likely to have the ability to see what’s usually hidden to most. When the spirit of this animal guides you, you can see the true reality, beyond illusion and deceit. The owl is a strong spirit guide for discernment and making decision based solid foundations. 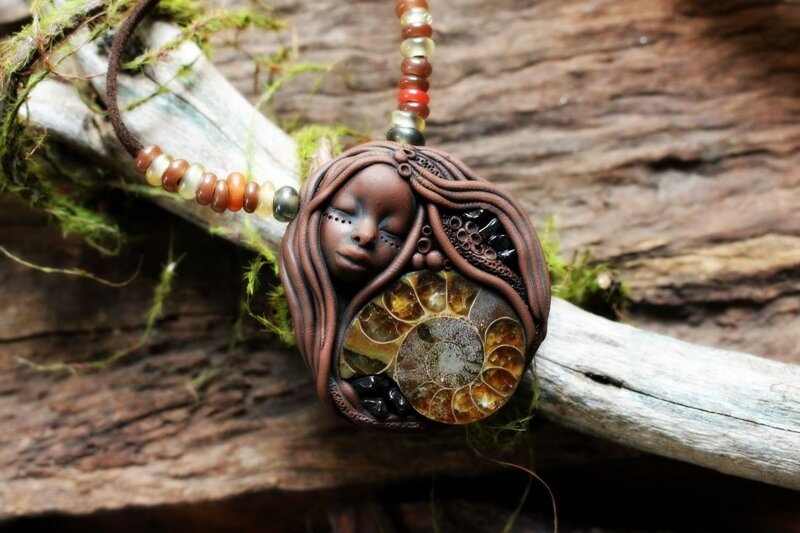 ​The Ammonite is a very powerful earth healing fossil. 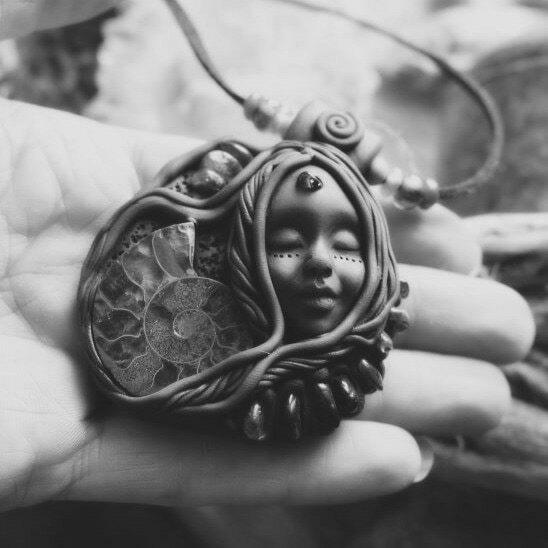 Its spiral shape symbolizes continual change and evolution. This is quite possibly my favorite 'stone' to work with, although not a gemstone of course, but the fossil of the ammonite mollusc. The extinction of ammonites coincided with the extinction of dinosaurs. Ammonites inhabited the world’s oceans and now appear as fossils in marine rocks. 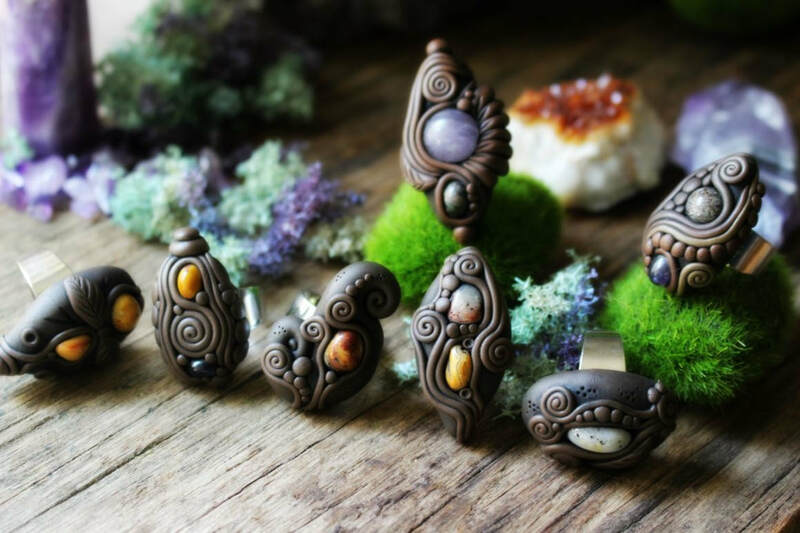 They are incredibly beautiful, and of course that spiral pattern is absolutely gorgeous! The name “ammonite” is derived from the name of the ancient Egyptian god Ammon who believed these creatures were divine. 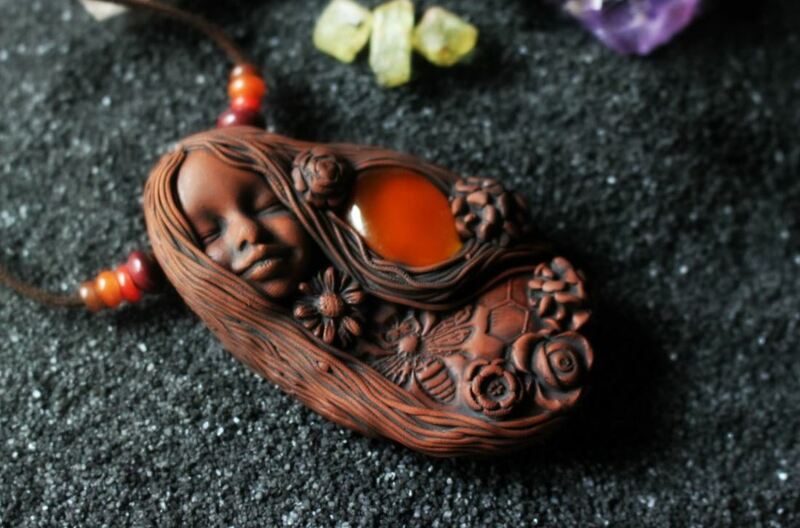 Traditionally they were used to honour ancestors and to connect to ancient sources of knowledge. ​I am lucky to know a few Bee Keepers too and I love planting out my gardens just for the Bees. I am a huge supporter of only buying Local Honey, and not using any nasty pesticides or herbicides etc. As an emblem of abundance, persistence, industry, communication, teamwork and fruitfulness, call on the Bee when you need these energies in your life. The Bee Spirit is very helpful when you’re working with solar magic, particularly sun Goddesses. She also supports success when it feels like you’ve reached a standstill in a project or goal. Also If you need support for fertility issues, let the Bee energy in. It’s amazing what anxieties can dissipate when the warmth of Bee’s sunny spirit shines on your heart! On that note, it’s becoming ever so important to plant garden's for bees so that we can have reliable pollination for our food crops. In a time where our landscapes are rapidly changing with modern farming practices, forests being clear-felled and of course, the impacts of climate change, we need to try and counter this with how we garden in the city and out bush. By choosing plants which have good flowers for the bees to eat from, you can provide an abundant and reliable food source for these important and bee-eautiful sacred beings. 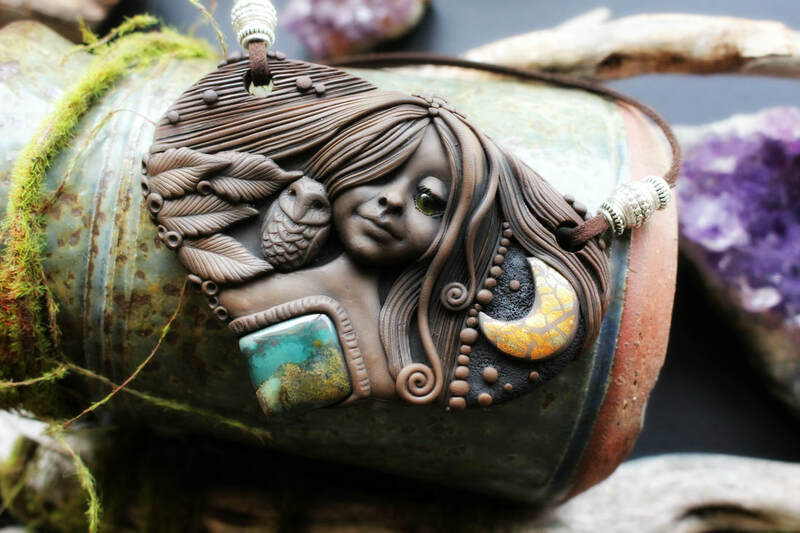 Owls are one of my favorites - We all know that an owl symbolizes wisdom, but she is also symbolic of a deep connection with intuitive knowledge. If you have the owl as your spirit animal, you are likely to have the ability to see and feel what is usually hidden to most people. The owl also offers the inspiration and the guidance necessary to deeply explore the unknown and the magic of life. 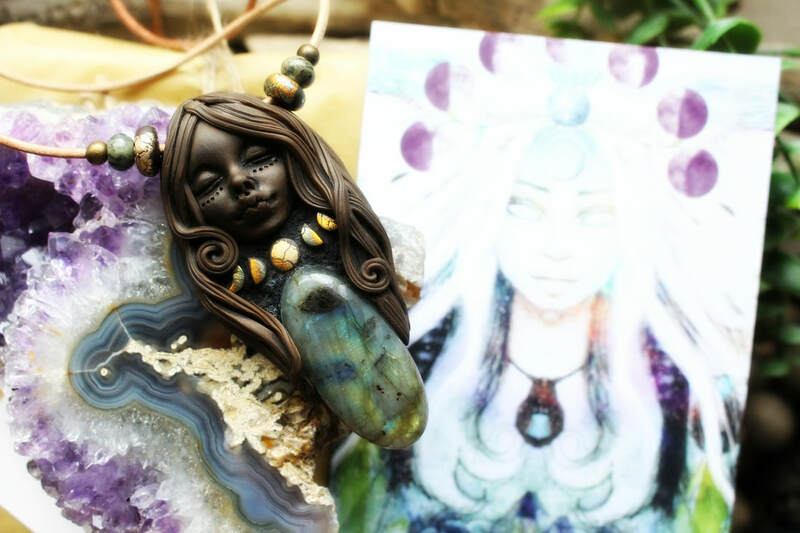 ​The range of Spirit Shift Necklaces are created using a beautiful Mica Shift Shimmer - These necklaces highlight the absolutely gorgeous gemstones used in each piece. The Mica Shift gives them an antique golden look, and the necklaces are fully adjustable. My favorite gemstones in these necklaces are the Labradorites and the Moonstones. Labradorite (also called Spectrolite sometimes) is a considered by mystics to be a stone of transformation and magic. Lore of the Inuit peoples claim Labradorite fell from the frozen fire of the Aurora Borealis, an ordinary stone that transforms to the extraordinary, shimmering in a mystical light that separates the waking world from unseen realms. Labradorite is a member of the Feldspar family and is treasured for its remarkable play of color, known as labradorescence. 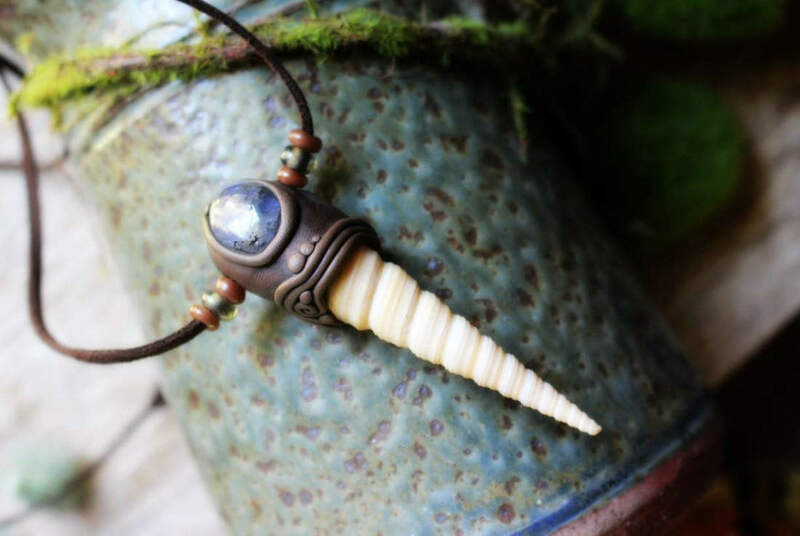 ​Since earliest times, Moonstone has been seen as a connection to the magic of the moon - an amulet of protection for travelers, a gift of lovers for passion, a channel for prophecy, and a path to wisdom. Our ties to the moon are strong. 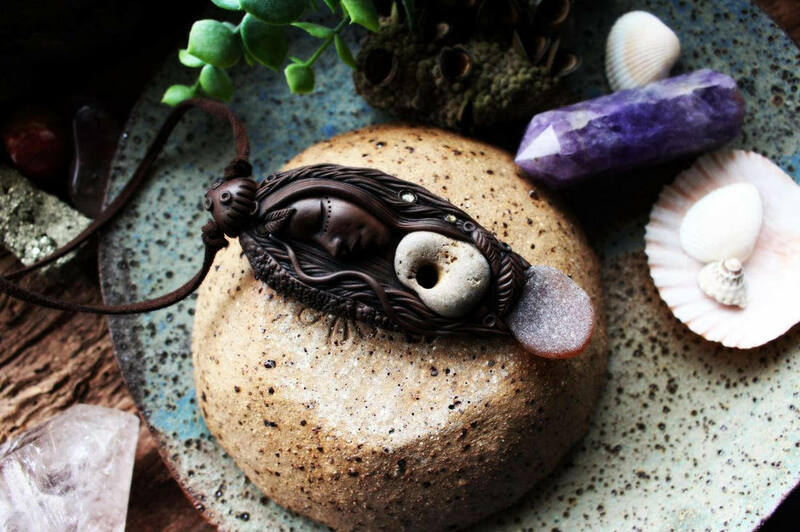 As it waxes and wanes in cyclic perfection, it creates the tides and rhythms of our mother, Earth, and influences our behaviors, emotions and spiritual growth. Moonstone through history was believed to calm and encourage, and aid in teaching us the natural rhythms of life - this is quite a unique stone. If there is one thing that is constant about the Moon, it is that She is ever-changing. 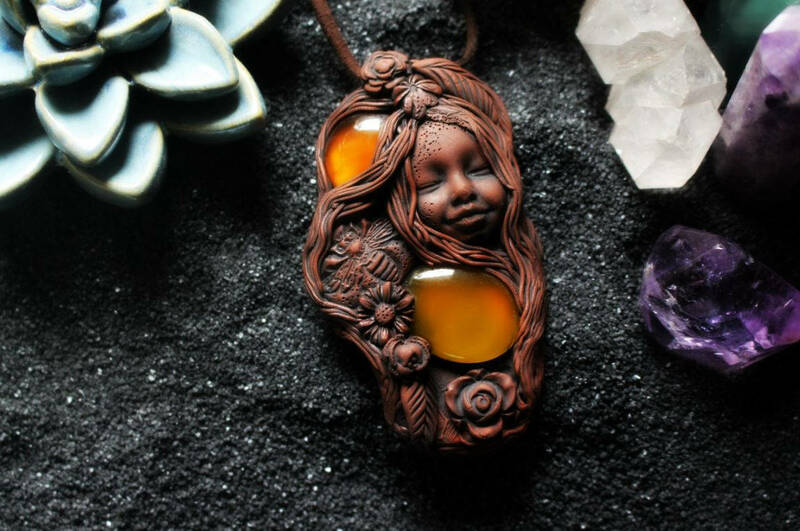 Lunar Eclipses & the Lunar Phases, are the inspiration behind these Lunar Phase Goddess Necklaces. The Moon marks the times of our life. Her cycle begins in darkness, then gradually increases in light until she is completely illuminated. One Moon phase to another, dying and being reborn, but without end, is so symbolic. Every generation passed has stood and stared at it, our ancestors, the same moon that you and I look at...generations to come, our great great grandchildren and beyond, will do the same. ​The moon wields her strong force and her influence, with all that is fluid. She is considered a luminary (a natural light-giving body), yet she produces no light of her own accord. She is completely reliant upon the sun's light to reflect (mirror) her image to our earthly eyes. This method of projecting light makes the moon a symbol of subtlety. Symbolic Moon Meanings: Time - Cycles - Psyche - Wonder - Shadow - Balance - Renewal Mystery - Emotion - Intuition - Passivity - Influence - Fertility - Transition - Femininity - Perception - Progression - Receptivity - Illumination. The phases of the moon have always had intricate meanings. 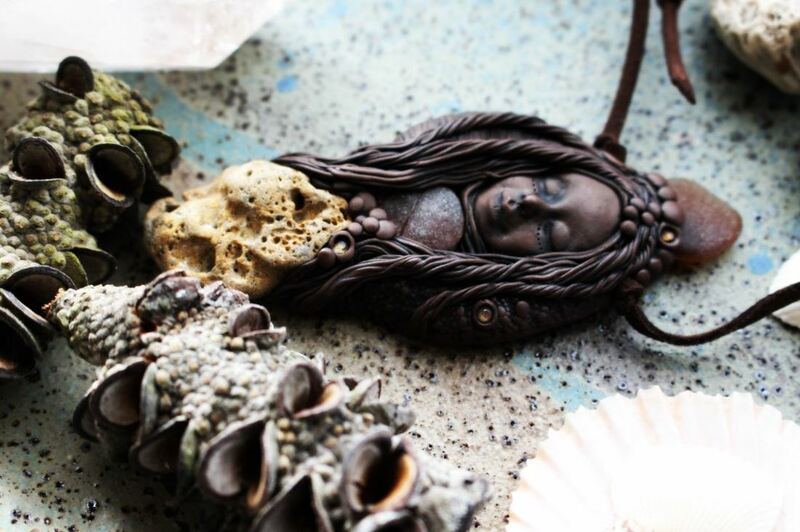 Waning Moon: Symbolic of letting go, surrender, release, quiet time, contemplation. Waxing Moon: Symbolic of growth, manifestation, attainment. Full Moon: Symbolic of the height of power, the peak of clarity, fullness and obtainment of desire. The Moon Phase Necklaces are the only TRaewyn necklaces which are created outside, under the light of the moon. There will be limited necklaces available due to the time involved to create each individual necklace. 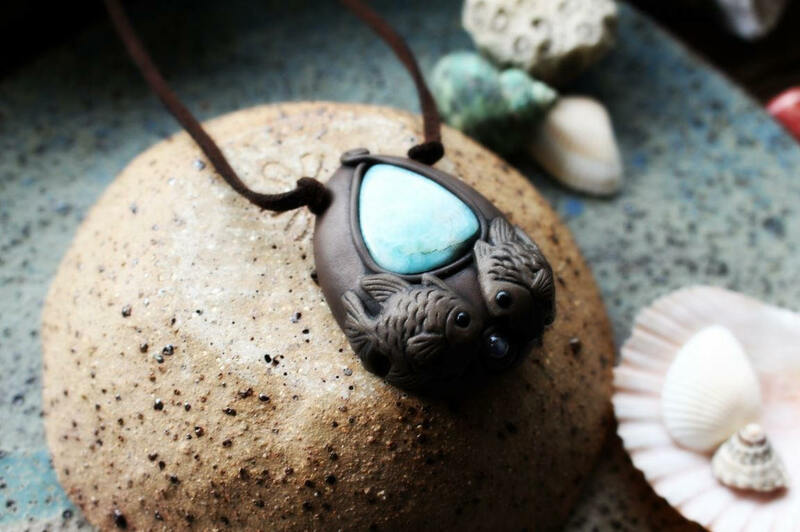 ​I have created some beautiful Ocean Mother, Ocean Goddess Necklaces and have used some special techniques to get the pattern of starfish and shells (I used my own collected ocean treasures to embed the patterns). ​The ocean is so very special to me, a place to go and clear your mind, renew your spirit, and wash away the negative. 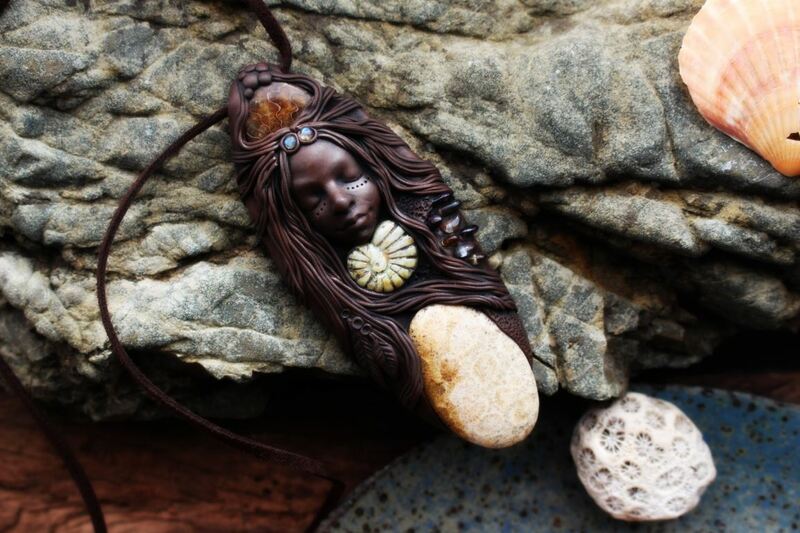 Ocean Mother, Ocean Goddess, Source of all life on Earth. You are, She Who Dances with the Moon. Each Wave Celebrates Your Power & Your Fierce Beauty. The silence of the shore speaks the wisdom of the ages. Healing flows from the Ocean in waves of tranquility and sanity. The past is healed as the tides bring change and renew all they touch. of the Great Ocean Mother and the unimaginable diversity of the deep Oceans of the world. Moments spent quietly at the Ocean feed the eternal parts of ourselves. 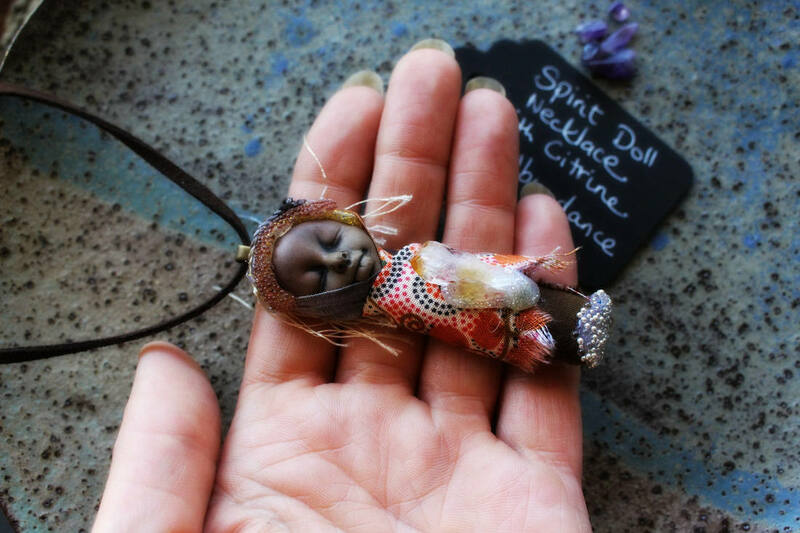 New to TRaewyn are these beautiful handcrafted Spirit Dolls! 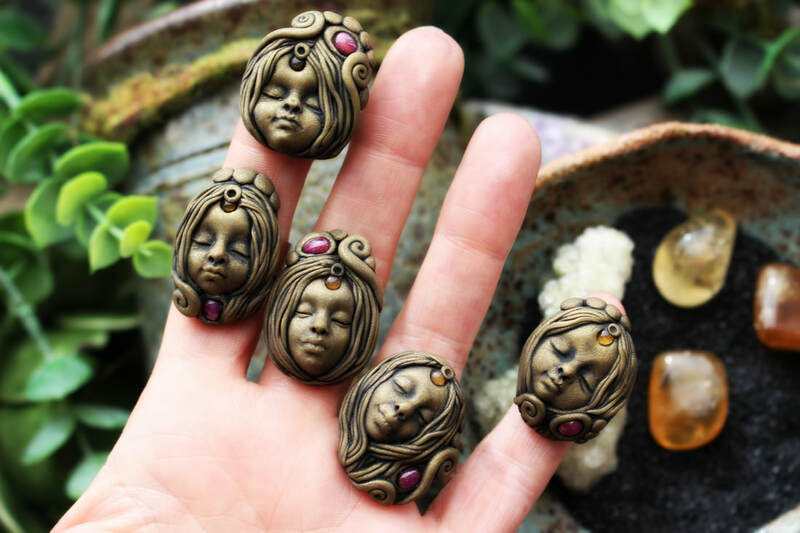 The large dolls are to hang on your wall, in fact the idea is to place your spirit doll somewhere where that she can watch over you. 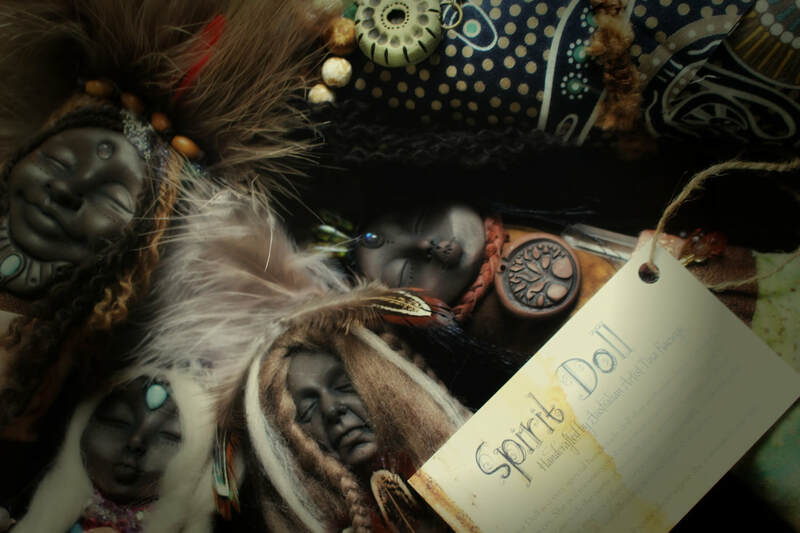 A Spirit Doll is a very special handmade doll that embodies hopes, dreams, and prayers. 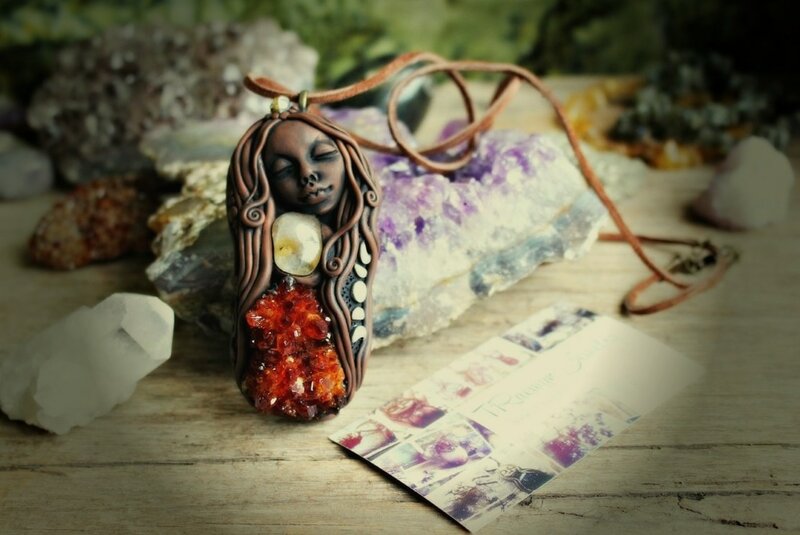 She is a messenger of your own inner voice, allowing you to communicate with the parts of yourself that are often hidden, or deeply protected. 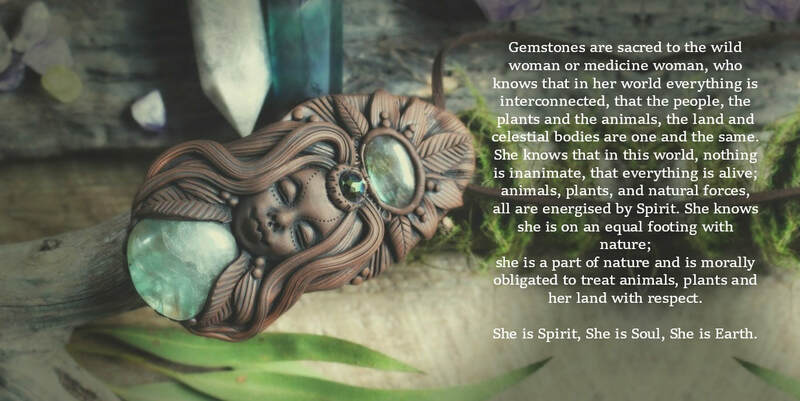 She inspires a deep connection to your spirit, awakening the truth and allowing personal transformation. 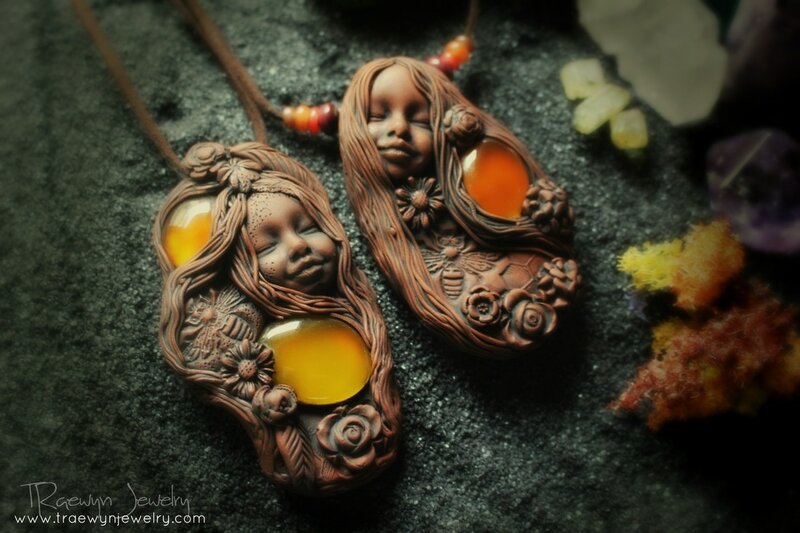 ​The spirit doll necklaces are much smaller versions, made to wear! 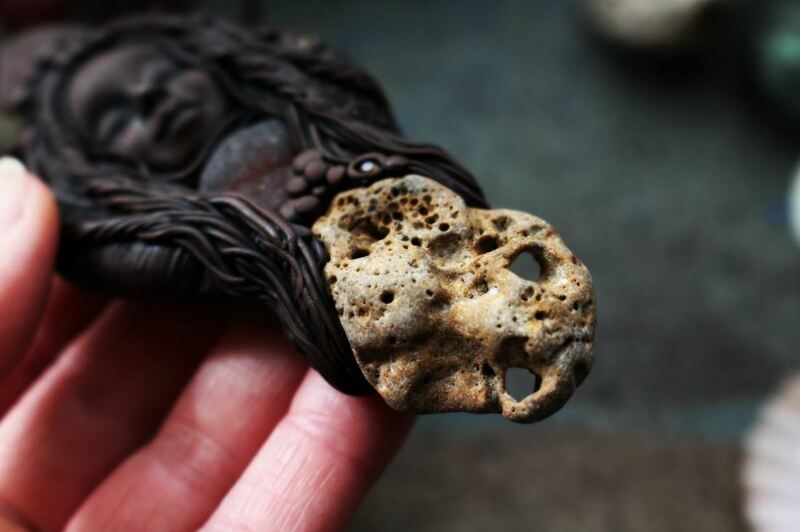 Hag stones are stones that have a small hole running all the way through them. They are usually found in streams or rivers and at the seashore, where the action of running water has created the hole in the stone. It is common belief that magic cannot work on running water, and as the stones are tunnelled by the force of this element they retain its beneficial influence. 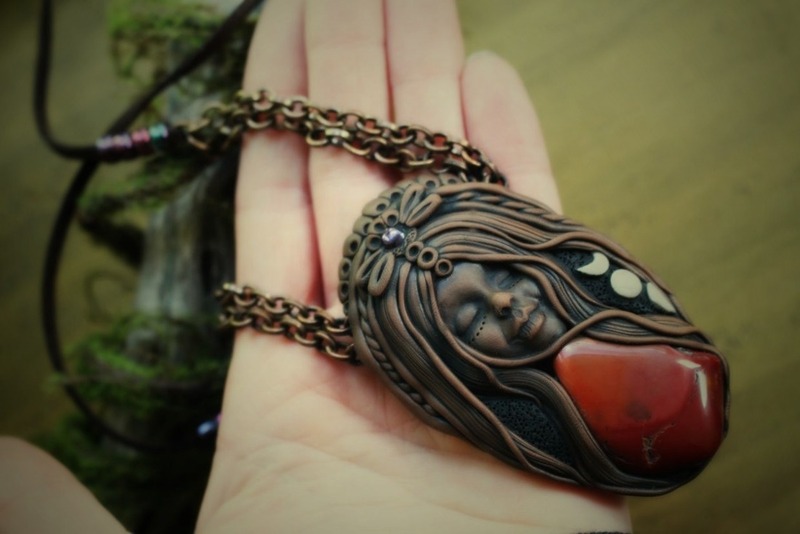 This makes them very good charms for deflecting away negative energies from the bearer. Hag stones are also known as Ephialtes stones, Holy stones, Holey stones, Wish stones. Nightmare stones and Witch Riding stones. In medieval times, they were credited with the power of protecting both people and animals from the influences of evil spirits and were hung around the neck or on the key or door to cattle stalls and stables. Living by the sea, I am now a regular participant in combing the beach for sea glass, I usually walk on the shore after a storm. During these storms, the powerful and pounding surf crashes again and again into the ocean floor dislodging and bringing to the surface stones, shells, and sea glass from below. After the storms clear, the water recedes, and precious jewels of sea glass are exposed. I have been very busy creating a whole range of gorgeous rings and earrings. The metal part of the rings are a Platinum colour plated copper ring shank - cuff style and adjustable. They are incredibly comfortable to wear. Be sure to check them out in the shop! 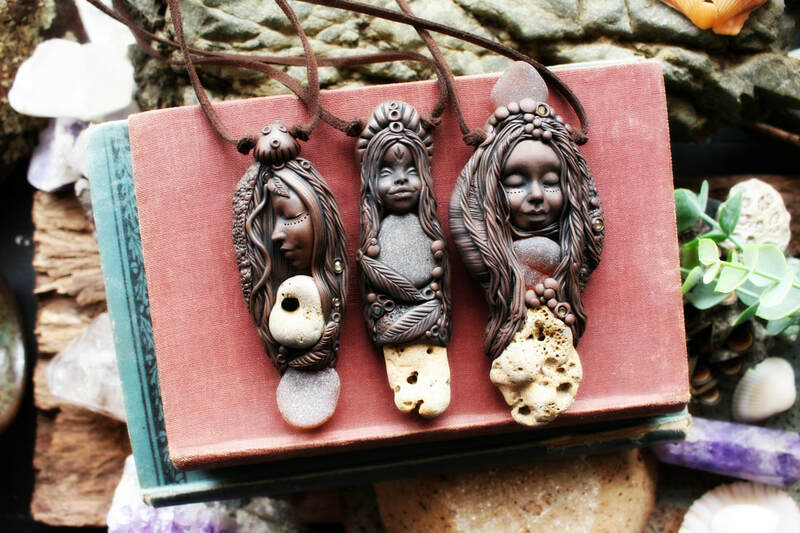 These goddess necklaces have been created using beautiful millefiori style butterflies - these are handcrafted from clay. 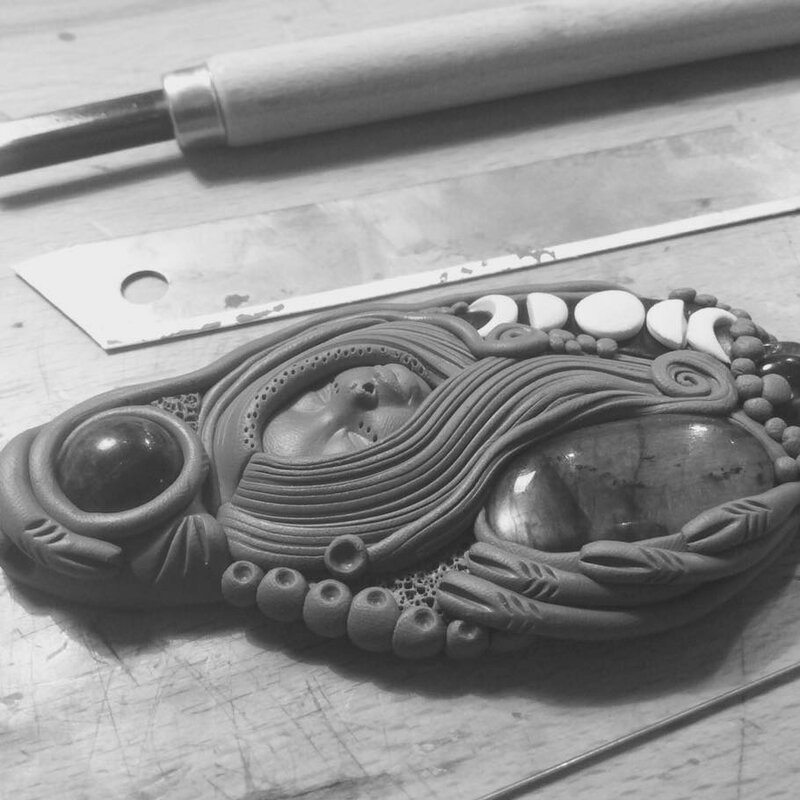 To highlight the subtle colors in the butterflies, the beads are created in the same style. ​The Butterfly is the symbol of change, the soul, creativity, freedom, of joy and colour. Their power is transformation, shape shifting and also soul evolution. The Butterfly begins life as a caterpillar, inside her cocoon. Growing her wings slowly. Cocoons can be safe and familiar, but they can also feel like a prison. While we are in that cocoon we can become afraid of what may be outside... trapping us and holding us back from ourselves, from our wants, dreams and desires, from our unlimited potential....But all the while our wings have been growing, and it is our instinct to break free and fly, with all of our true glorious colors! The Butterfly can help you see that leaving the cocoon suddenly opens a new door, a new life, a new begining, that there is power in trust and vulnerability. 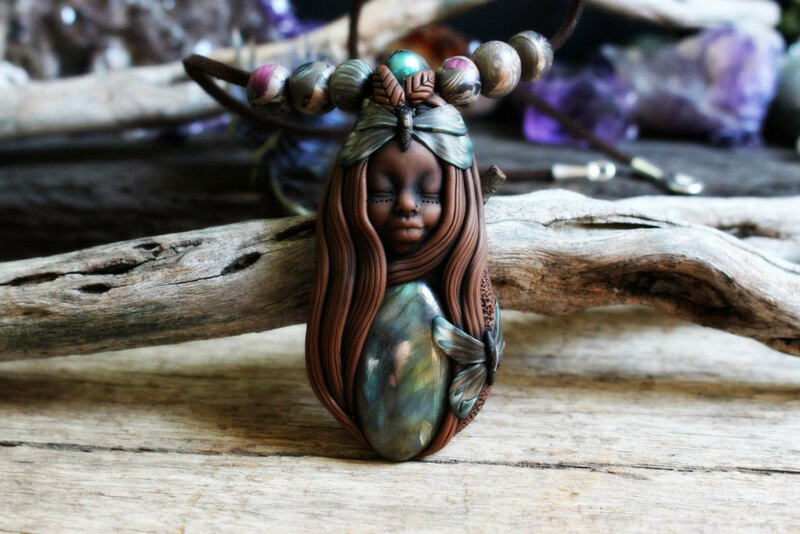 She reminds us to trust our intuition, to have faith in ourselves, trust that our own untried wings will carry us furthur than we ever imagined.